Lots of hair loss products claim to prevent hair loss, eliminate dandruff, and re-grow hair but what are their side effects despite their success? Rogaine, for example, has had great success with hair re-growth for 1/3 of their young users, but it also has many side effects like retention of excess body water, hair growth on shoulders and earsm, and can be dangerous for people with low blood pressure. The active chemical in Rogaine is Minoxidol, which is used for treating patients with hypertension. Using Rogaine is a lifelong commitment; meaning if you stop using it, whatever hair you grew back will fall out! 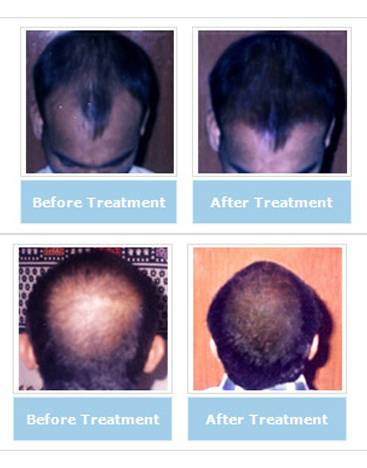 Our Hair Loss Treatment has been in use for over three thousand years in a variety of forms. This hair loss product was discovered in its crude form in the foothills of the Himalayas in India, being applied to scalps by the indigenous populations. Almost the entire populations of this area have a full, beautiful, healthy head of hair. This anti hair loss discovery was scientifically researched for seven years before getting approval from the Indian government to be marketed as a commercial hair loss treatment. Research and development on this hair loss product continues even today, with our team building upon the benefits achieved so far. We are committed to maintaining the depletion ratio by being prudent with the way we harvest the herbs and ensure the best, scientific method of re-growth of this anti hair loss herbs; despite the rise in harvesting prices. Saini Herbal Scalp & Hair Conditioner® can help to fight DHT induced hair loss and is one of the best DHT blocker in the business. Saini has already helped thousands of women and men to stop hair loss and to promote natural hair growth through safe and permanent measures. It is a 100% natural herbal remedy that has no side effects and works solely in the scalp area. It works by removing the buildup of DHT, which then promotes healthy hair growth.